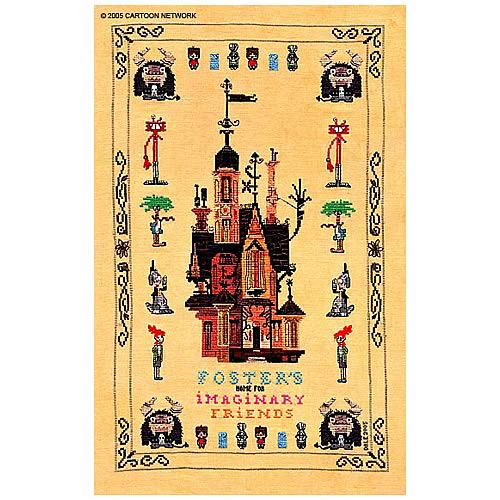 The "Home Sweet Home" Fine Art Giclee print is a reproduction of a hand-made cross stitch that captures the Victorian styling of the Cartoon Network original series, "Foster's Home for Imaginary Friends." This Fine Art Giclee is approximately 19-inches tall x 13-inches long and is limited to only 500 pieces! This piece was created to evoke the feel of an antique "Home Sweet Home" Country Sampler and was meticulously stitched by Dale McCracken, the brother of the series' creator, Craig McCracken. It was produced on 25 count hand-dyed linen with hand-dyed cotton thread, some of which were dyed by their mother, textile artist, Eva Lynn McCracken.